ABOVE: A pie chart indicating 100% tastiness. Foster Cheese Haus in Foster (near Osseo) is the place to go to experience three of the things that make Wisconsin’s culinary culture what it is: artisanal cheese, microbrew beer, and locally produced wine. 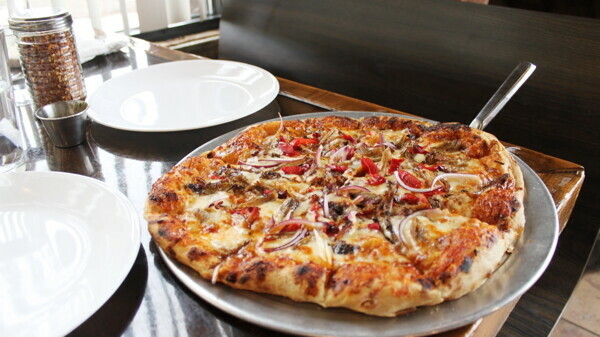 In addition to a menu full of calzones, stromboli, bruschetta, wood-fired sandwiches, salads, and pies, Foster’s also serves delicious homemade wood-fired pizzas. Now, for the first time ever, you have the opportunity to see firsthand how these pizzas are produced. Foster Cheese Haus is offering a 90-minute class on how to prepare, build, and bake a professional-style pizza. Organizer Nancy Frank says that chef Lewis Campbell “will have people learn how to make dough from scratch, stretch it, throw it, create a pizza, and bake it in the Foster Cheese Haus wood-fired oven.” Given that this is the first event of its kind that Foster Cheese Haus is putting on, they are excited to see how it goes and have already begun planning two future classes. And for anyone who thinks 90 minutes is a long time to wait for a pizza, Frank promises that attending this class will be much better than staying home and zapping a frozen pizza. “There is really no comparison between the pizza the students will create and a frozen pizza,” Frank says. “One taste will convince them of that! We will also be using fresh ingredients.They will be able to eat their pizza there or take it home for their family.” This class is better suited for teens and adults than for younger children. Expect a fun-filled night with a delicious ending.